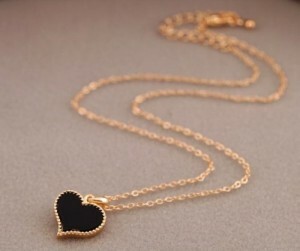 Gold Heart Shaped Necklace Just $0.99 SHIPPED! You are here: Home / Great Deals / Amazon Deals / Gold Heart Shaped Necklace Just $0.99 SHIPPED! Here’s a nice, simple necklace deal for you!! Get the Gold Heart Shaped Necklace in black, red, white or leopard print for just $0.99 on Amazon. And, shipping is FREE!